This V-Groove Idler Pulley works both as an OEM replacement and as a general purpose pulley for power transmission such as compressors, industrial fans, lawn mowers, snowblowers, and electric motors. It comes with a bore adapter to bush down from 3/4'' to 3/8'' inside diameter. 35500038D features a heavy duty sealed radial single-row bearing.This part is Painted Black to prevent rusting. Back Side Offset: The width from the center of the pulley to the backside edge of the hub or bore adapter. Bearing ID: The inside diameter of the bearing used in the pulley. This is useful for determining if a bore adapter can be added, and if so, which sizes will fit. 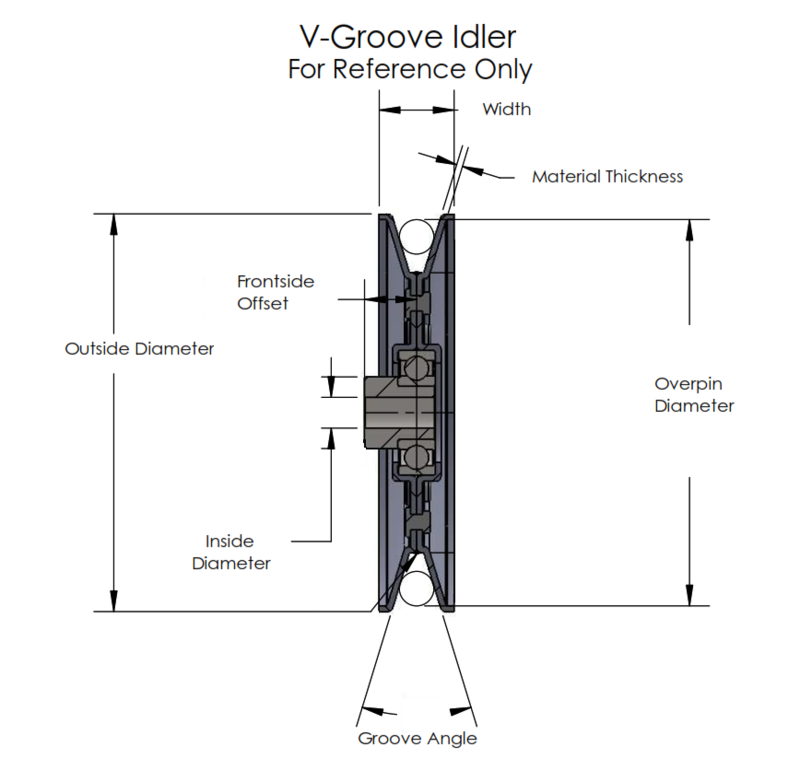 · The narrowest part of the belt does not touch the bottom of the V-groove. · At least 3/4 of the belt fits inside the groove of the pulley. A slight overhang is acceptable. IMPORTANT: A pulley can work with your belt but still not be appropriate for your system. 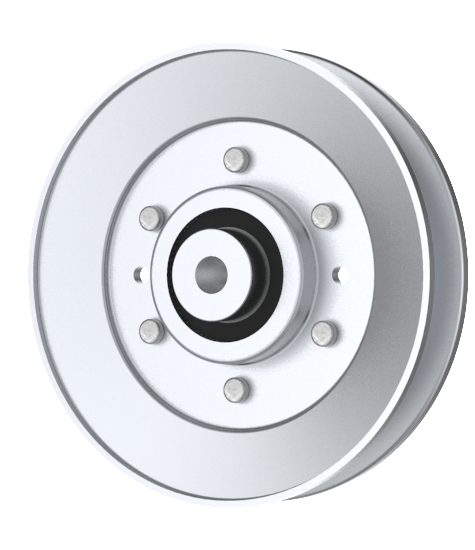 For more information, check out our blog post, The Best Pulley for your V-Belt or contact us for assistance. Finish: The finishing material used to prevent rusting in steel or cast iron products. Zinc Plating and powder coat provide the best rust prevention. Frontside Offset: The width from the center of the product to the front edge of the hub, bearing, or bore adapter. Groove Angle: The angle of the v-groove. This is largely governed by the diameter of the pulley, but can affect how deep in the groove your belt will ride. Inside Diameter: The distance across the center hole, or bore, of the product. This dimension should match the diameter of your shaft or bolt. Material: Describes what the product is made from. Plastic, aluminum, and diecast are softer, lighter, and do not rust. Steel and cast iron are meant for heavy-duty applications, but can rust in certain circumstances. Material Thickness: Refers to the thickness of steel products only. This helps determine the overall sturdiness of the part. For Idler Pulleys, material thickness greater than 0.07” is considered Heavy Duty. For Drive Pulleys, thickness of 0.14” or greater is Heavy Duty. Outside Diameter: The distance across the circle of the product, from outside edge to outside edge. Overpin Diameter: An engineering dimension used to represent belt effective diameter. Cylinders or "pins" are placed at the top and bottom of the pulley's v-groove, the measurement is taken from the top of the upper pin to the bottom of the lower pin. Pin Diameter: Diameter of the cylinder used to determine the belt with the best fit in v-belt drive and idler pulleys. Other belts may work with the pulley, but the fit into the v-groove will be different. The below chart shows the pin that corresponds to various belt sizes. Stickout: The distance from the edge of the pulley’s flange to the edge of the bore adapter or hub. This is easiest to measure if the pulley is placed hub down on a flat surface. The stickout will be the space between the surface and the outside edge of the pulley. A negative stickout means that the pulley will lie flat on a surface with no gap. Throughbore: Length of the bore, from one edge to the other. The Frontside Offset and Backside offset together equal the length of the throughbore. For information on how to best measure your pulley, see our How to Measure Your Pulley page or contact us at sales@phoenix-mfg.com or 1-800-776-9315.